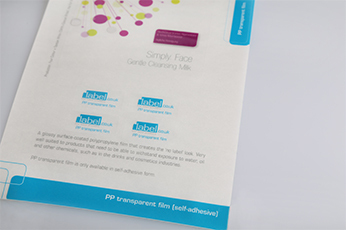 Looking for self-adhesive labels on a paper or film, glossy or matt? Our papers are as individual as your requirements and our standard materials are always in stock. Are you looking for something industry specific or have you always used an exact material and do not want to change it? In addition to the standard materials below, we have many other papers and films in our portfolio. Contact us! Take the opportunity to review our materials and print “live” by requesting a Sample Book. Where ‘shine’ and vibrant colours are required, this self-adhesive, high gloss material is sure to do the trick! 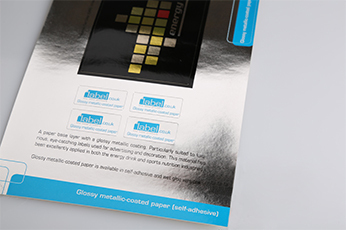 This alternative to glossy paper has a matt surface. Again a completely standard and versatile material. 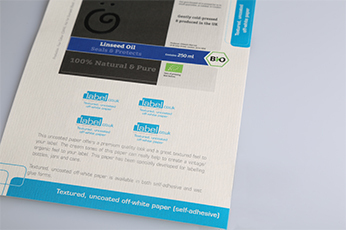 Textured, uncoated papers add an extra touch of quality/organic to your label. Popular in food and beverage industries. 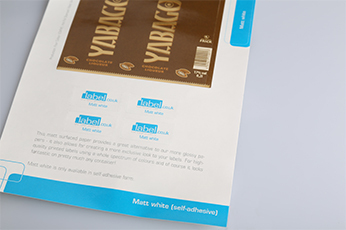 This glossy, metallic coated material offers the opportunity to create high-impact, metallic labels. The trusty standard for film labels; waterproof and easy to work with. Used across all industries. Create a “no-label look” with this transparent material. On trend and used a fair amount in the beverage industry. Robust, stable premium material, which is particularly suitable for high-quality spirits and food. Due to the material thickness, premium paper matt and cotton paper are only partially suitable for use on small, very curved surfaces. In this case, we recommend our matte standard material. The paper is made of 100% cotton and impresses with its high-quality, velvety, silk surface. The material has a very high-quality, filigree paper structure. This premium material is also great for spirits and premium food products. The absolute standard material when film is required. Strong adhesion, brilliant shine, easy processing and strong protection for your product are the advantages of the white film. For product labels where resistance to external influences is important, e.g. for drinks and cosmetics. 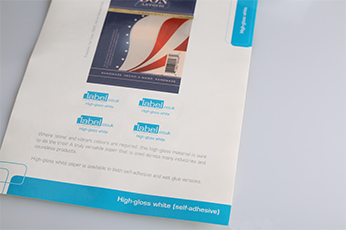 All of our self-adhesive label materials feature a permanent adhesive as standard. In addition to this we also offer peelable, freezer-grade and opaque adhesives on selected materials. 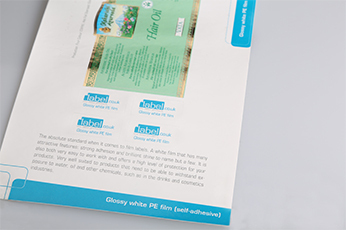 The standard materials which we offer predominantly feature a glassine paper carrying material. Where you or your contract filling partner require a PET carrying band, please get in touch with our customer service team. The information given here is not a guarantee and is merely a recommendation based on our experience. Therefore, we advise you to test extreme demands on the materials always under the respective application requirements. Where you are unsure, please contact our customer service directly with your questions and ideas, we will be happy to make you an individual offer. You can reach us either by telephone at 0203 588 1080 or by e-mail at info@label.co.uk.